This is the scene after every waffle breakfast in our house and it just cracked me up this morning. 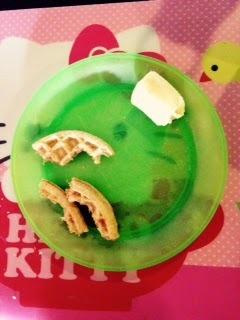 Yep, according to my daughter, the edge of the waffle is a no-go zone. I might have spoiled them by cutting off the crusts of their sandwiches. But, in my defense, I wanted them to eat more and waste less bread. If I leave on the crust, they give it a very wide berth and stay a good half an inch away from the edge. If I make a very thin slice of crust of the edge of the bread, the whole sandwich gets eaten. Did you know, that quesadillas have crusts, too? Yep. Did you know, that it's very likely your kids will like completely opposite things? Maybe this is something that can stem from sibling rivalry on occasion, but my boy has NEVER liked hot dogs or hamburgers - really, meat of any kind. His sister is WILD about hot dogs and burgers. Of course. My son, like his parents, could eat pizza for every meal. Our daughter does. not. like. pizza. WHAT. Did you know, that if one of our kids has one bad interaction with a food, that he or she will avoid it for years? This could be decades, because the jury is still out on turkey for my son. Which, ya know, limits a lot of easy lunches. Did you know that they can subsist on the same food for breakfast, lunch and dinner indefinitely without getting sick of it? If I let either of my kids eat pb&j for every meal, of every day, they would be just fine with that. Did you know that if it's served at a restaurant or party, they totally eat (and enjoy!) stuff they'd never touch at home. I suppose I don't make grilled cheese as healthy and nutritious as the Dirty Bird, but I mean, it can't be THAT far off?! And salami sandwiches at Jimmy Johns are a staple, yet when I try to make one at home!? Ha! Did you know that when your child likes something, you will go out and buy it in bulk, only to have them suddenly decide they do not like it? At least I use a lot of black beans in my cooking, and those dozen cans eventually get used. But that phase came and went pretty quickly, as did string cheese, mandarin oranges, that time we caved on Cinnamon Toast Crunch... Yeah, there's still a big sealed bag of that stuff just gathering dust in our pantry. Anyone want some Cinnamon Toast Crunch? CTC is Ryan's fave...after Golden Grahams. I'm SO bringing the bag to our next brunch date!